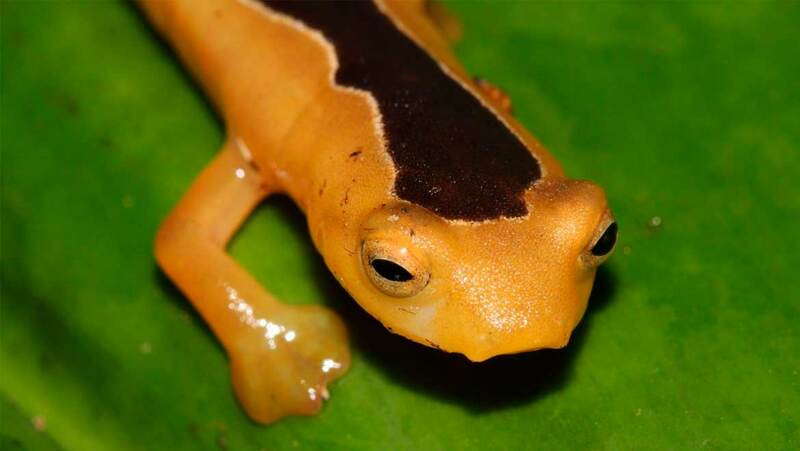 The rare Golden Wonder salamander was first found in the Cuchumatanes Mountains of Guatemala in 1975, by two students named Paul Elias and Jeremy Jackson. This first sighting was also unfortunately to be the last of this species, with the Latin name Bolitoglossa jacksoni, for 42 years. Conservationists feared that it had gone extinct, but now an exciting new sighting confirms that in fact this species is still alive. Carlos Vásquez-Almazán, curator of herpetology at the University of San Carlos of Guatemala said of the find: “Having found this species is like having returned it from extinction. ”Vásquez-Almazán has spent years trying to relocate this mysterious salamander, and has personally carried out 30 separate expeditions to look for it, as well as training the guards who patrol to reserve on how to look for signs of the animal whilst they are out on patrol. In fact, it was one of the park guards of the Finca San Isidro Amphibian Reserve, Ramos Leon-Tomas, who spotted this latest sighting whilst out on patrol. The find comes as part of a campaign by the Global Wildlife Conservation to rediscover some 1,200 species that have been ‘lost’. The Golden Salamander, also known as Jackson’s climbing salamander, was in the top 25 of that list. Luckily for the salamander, the Rainforest Trust and Global Wildlife Conservation worked with a number of other groups to protect the forests in 2015. It’s quite possible that without this protection in place the habiate would already have been destroyed for coffee plantations or the timber harvested, and this tiny species would be on the brink of extinction, if not already gone. Because this little golden salamander has actually only been spotted three times, which means that we know incredibly little about this tiny creature. The latest specimen, photographed by park guard Ramos Leon-Tomas was located at an elevation approximately 1,000 feet higher than the salamander was thought to occupy. Potentially, this could mean that the species is adjusting its territory due to the impacts of climate change, or that actually the range of this species is far larger than initially thought. The truth of the matter is that scientists don’t actually know. Vásquez-Almazán goes on to say that the discovery gives hope “that we can recover much of the diversity of our forests that we believe has already been lost.” And that’s not only good for the golden salamander, it’s good for all of us.